The client’s request was to create a space that would inspire while working in the adjacent art studio, provide a tranquil haven from everyday life and accentuate the many unique views from within the home. Incorporating the client’s interest in the Asian arts, AguaFina developed a garden that brings in many elements into a small space. Reminiscent of a traditional Japanese strolling garden, and at the same time similar to a courtyard garden, the Koi pond and garden allows the visitor to travel both physically, and mentally. Sound plays a key role in the garden as well, and sometimes from the most unlikely of sources. A pathway of stones imported from Singaraja, Indonesia passes through the garden and the stones emit a metallic “clinking” sound when walked upon. It was essential that the Zen garden remain relatively quiet while the sound of water could be heard in other parts of the garden. 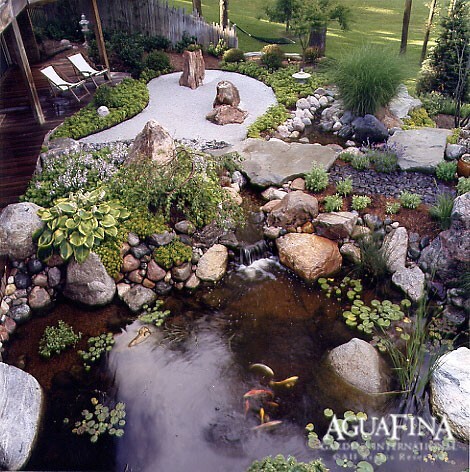 To achieve this effect, the waterfall was situated lower then the Zen garden and built with an echo chamber to move the sound away from the Zen garden. The fountain chosen also produces a controlled sound by allowing the water to travel down the edge of the stone instead of cascading freely from the stone. A traditional Asian walkway of clear cedar extends over the waters edge, bordering the garden and connects the art studio to the lower level office. The client, a very talented artist in her own right, uses the area outside the art studio as a space for contemplation that overlooks the dry raked Zen garden. 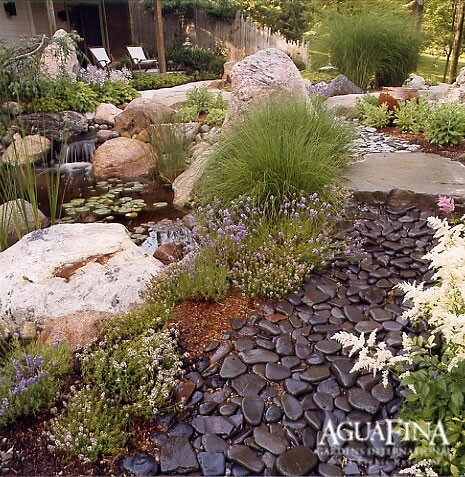 The garden is formed from pieces of petrified wood and crushed granite. Respecting what occurs in nature and trying to capture that essence (as is traditional in Japanese Gardens), the overall garden seems to revolve around the Koi pond and streams. The walkway is cut around a large boulder that was set as part of the pond, and it indeed appears that the house and deck were built around the pond. 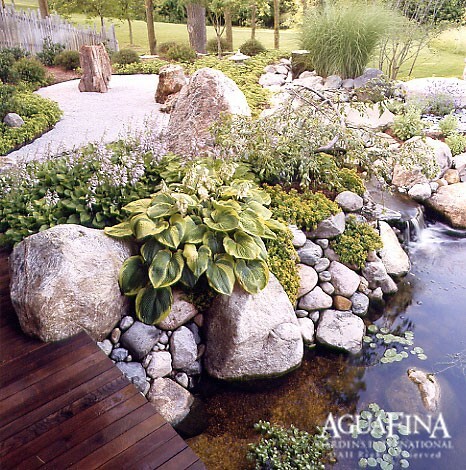 A natural stone pathway winds around the pond and includes two separate natural stone bridges. A promontory stone placed within the pond gives a view into the deepest section of the pond. 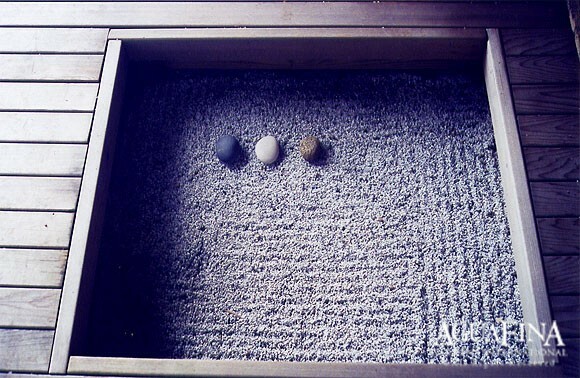 The stone grouping in the raked Zen garden is comprised of three pieces of imported petrified wood, accented by crushed granite. 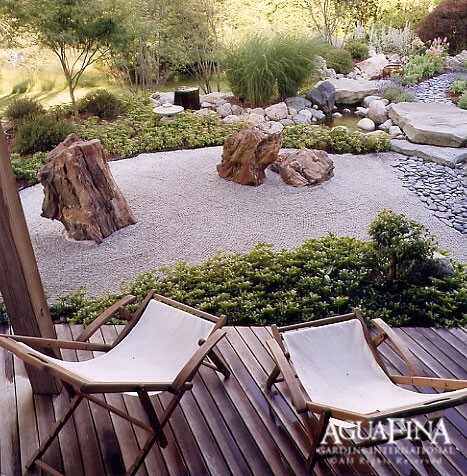 The theme of water and movement were incorporated into this space using the principles of the dry raked Zen Garden. The raked gravel represents waves and movement of water, while the hand placed petrified wood resembles islands in a body of water. Unique pieces of garden art are found though out this Japanese garden, such as this small detail formed into the deck near the art studio. This small element reflects and mimics the idea of the larger Zen setting found in the garden. From the natural stone fountain and Koi pond to the stone pathways, visitors experience elements common to a traditional Japanese strolling garden, including subtly placed pieces of garden art and hand carved granite stone lanterns.